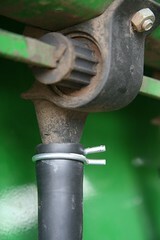 All work on the farm seems to start with servicing the equipment. 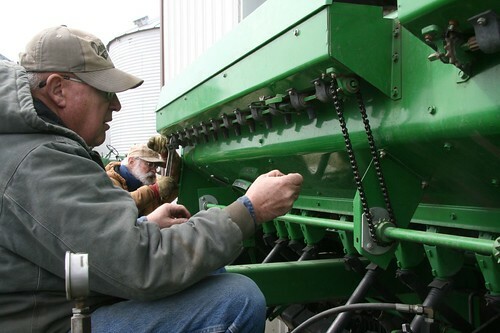 We purchased a used fifteen-foot grain drill (a type of planter) this winter and before we could even think about planting our oat crop, it had to be looked over, every part of it examined and tested, all the joints greased. Since we are abiding by National Organic Program regulations, we also had to clean it thoroughly, blowing and vacuuming every bit of non-organic seed and any other dirt or chemical residue from the machinery. One of the reasons we wanted this particular drill is because it had a grass seed box: basically, it has two hoppers for seed, one for larger seed and one for smaller seed. This is important for us because we want to seed cover crops along with our grains (for soil health and weed/erosion control), and this feature allows us to plant both the main crop and the cover crop at the same time. That means fewer trips over the field, less soil compaction, and lower fossil fuel consumption. 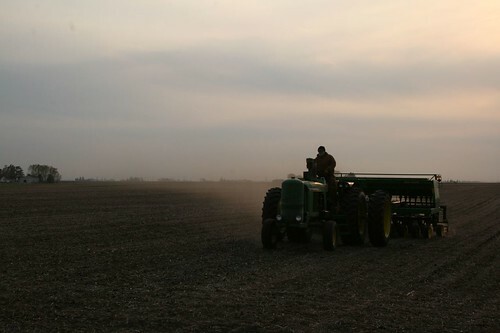 Plus, planting requires the weather and soil conditions to be just right: dry enough, not too dry, warm enough, rain coming soon afterward, but not too much rain…what a relief to do it once and have it done. This drill’s grass seed box had never been used, so it required quite a bit of set-up. Above, my dad is turning the long rod that moves the grass seed (usually driven by the wheels turning) so that my uncle Johnny can attach the brand-new chains that we found in a corner of the box, covered by an inch-thick layer of dirt. Later, we cut and attached the hose that directs the seed from the box on its way down to the ground (right). We went to four different stores looking for the special pliers we needed to put on those little metal clamps, and we ended up finding one…in our friend Butch’s toolbox. 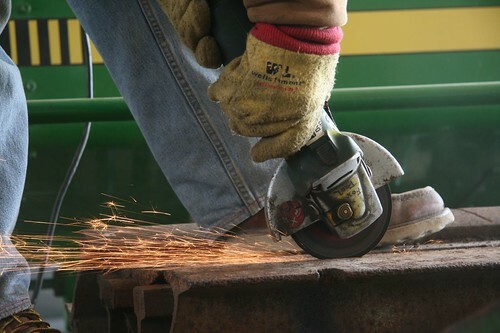 These pieces of rail were attached to the back of the drill to weigh it down so that the wheels would push farther down into the ground. 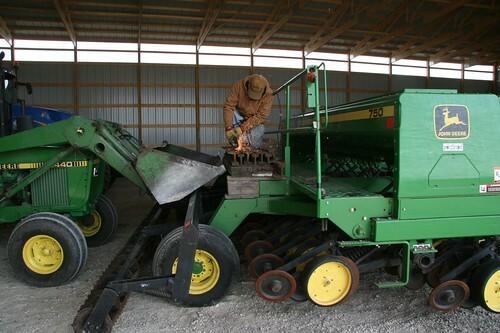 The former owner of this grain drill used it for soybeans, fairly large seeds, which he planted deep into hard ground after one crop had already come off in that season. We want to plant smaller things that are planted more shallowly – grains like oats and wheat, interseeded with tiny seeds like alfalfa and clover. 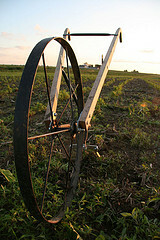 So we don’t need to cut down into the ground so far; we don’t need these weights. Just have to take them off, right? Well…our research showed that they weigh about 153 pounds per foot. That means that we had something like 3 tons of iron here, each piece weighing almost 500 pounds. And then it turned out that they were welded together. This was going to be a rather larger project than we had anticipated. My dad said later that he was afraid that his beard might catch fire! 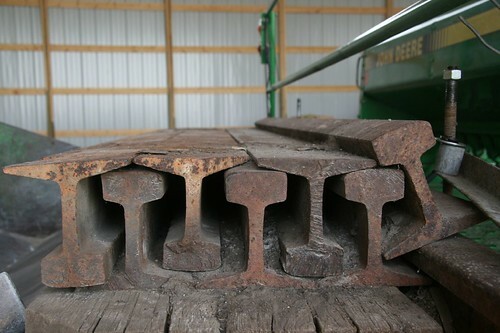 Here you can see our plan: as each piece of rail was freed, we used crowbars to roll it off onto the bucket of the tractor and then moved it to a corner of the shed for storage. I definitely have a renewed respect for the strength of John Henry and his early track-laying railroad coworkers. We hooked the drill up to the (borrowed) tractor and tested it – the tractor could pull it, and the seeds seemed to come out at the right rate. Huzzah! Rain was predicted for the next day, so we started in earnest, working against the clock and into the evening. This photo shows the direction of the wind, but you can’t tell how hard it was blowing. Take my word for it, it was windy. John is wearing at least 5 layers in this photo. He’s also making sure that the planter is no more than 8 inches from the last row, engaging, disengaging, raising, lowering, and turning at the ends of the rows. There’s a lot to concentrate on. We got about halfway done – 10 acres or so – when we realized that the tractor was low on fuel (it runs on propane). Since it was almost dark anyway, we called it quits for the day. 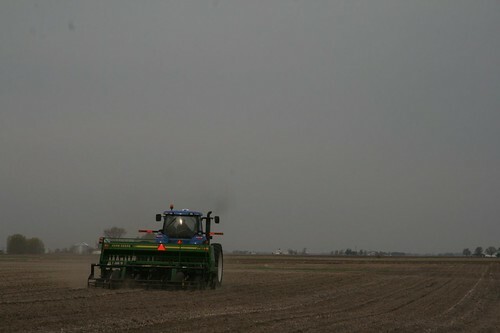 The next morning’s weather was even worse – so windy and cold that we decided it wasn’t possible to finish planting the oats on the open tractor we had been using. Uncle Johnny saved the day once again by offering to use his closed-cab tractor to finish the job. (He’s also really skilled at all that maneuvering, so we lucked out doubly.) You can see how dark the western sky is here – we finished not 45 minutes before the rain began, and it rained for nearly a week straight after that.